The U.S. and Canadian governments have unveiled a long-awaited new standard for the tank cars used to transport crude oil and ethanol that includes numerous safety improvements. But it is far from the final word on efforts to reduce the risk of catastrophic derailments, such as the one that killed 47 people in Lac-Megantic, Quebec, nearly two years ago. And industry and environmental groups are bracing for a court fight over portions of the regulations announced Friday that they don’t like. Most of the current tank car fleet that doesn’t meet the new requirements will be allowed to carry ethanol and some types of crude oil for eight more years. Environmental groups and some lawmakers objected Friday to the extended timeline. It will be two years before the Energy and Transportation departments complete a study on the properties of crude oil and how they affect the way it reacts in derailments. While the rail industry supports the new tank car standard, it opposes the requirement for an electronic braking system on certain trains. The regulation also expands the amount of information about rail shipments of flammable liquids that will be available to emergency responders, but incorporates it into an existing regulation that would exempt it from public disclosure. In Washington on Friday, Transportation Secretary Anthony Foxx and his Canadian counterpart, Minister of Transport Lisa Raitt, rolled out the new regulations, which are generally in sync on both sides of the border, given the seamless nature of the North American rail system. The new tank car, called the DOT-117, will have features that are designed to prevent it from puncturing in a derailment and to better withstand prolonged exposure to fire. The regulation requires that beginning Oct. 1 new tank cars built to transport flammable liquids have thicker shells, full-height shields on each end of the cars and a layer of thermal insulation on the outside. The new standard also requires more protection for valves and outlets. The railroad industry supports the new tank car design but opposes the requirement that certain types of trains be equipped with electronically controlled brakes by January 2021. Since the late 19th century, trains have operated with mechanical air brakes. The Federal Railroad Administration has said that electronic brakes would enable trains to stop more quickly and could prevent the accordion-shaped pileups characteristic of recent oil train accidents. In a phone call with reporters Friday, Ed Hamberger, the president and CEO of the Association of American Railroads, a leading industry group, criticized the braking requirement, saying it wouldn’t prevent accidents. The industry could avoid the requirement by operating the trains it applies to at 30 mph or limiting them to 69 cars. Either way, Hamberger said, it would be costly and disruptive. Foxx said the electronic braking was reliable technology and that he hoped the railroads would accept it. He was also confident that the regulation would withstand a court challenge. The rule might also face a challenge from environmentalists, who object to the retrofitting timeline. There have been four major oil train derailments since the beginning of the year, and environmental groups fear there might be more before the new requirements kick in. Imagine a mile-long train transporting crude oil derailing on an elevated track in Jersey City, N.J., across the street from senior citizen housing and 2 miles from the mouth of the Holland Tunnel to Manhattan. The oil ignites, creating an intense explosion and a 300-foot fireball. The blast kills 87 people right away, and sends 500 more to the hospital with serious injuries. More than a dozen buildings are destroyed. A plume of thick black smoke spreads north to New York’s Westchester County. This fictional—but, experts say, plausible—scenario was developed by the Federal Emergency Management Agency in one of the first efforts by the U.S. government to map out what an oil-train accident might look like in an urban area. Agency officials unveiled it as part of an exercise last month to help local firefighters and emergency workers prepare for the kind of crude-by-rail accident that until now has occurred mostly in rural locations. “Our job is to design scenarios that push us to the limit, and very often push us to the point of failure so that we can identify where we need to improve,” said FEMA spokesman Rafael Lemaitre. He said a second planning exercise is scheduled in June in a suburban area of Wisconsin. Jersey City’s mayor, Steven Fulop, said the drill showed participants that they need to improve regional communication to cope with an oil-train accident. “It would be a catastrophic situation for any urban area and Jersey City is one of the most densely populated areas in the entire country,” he said. 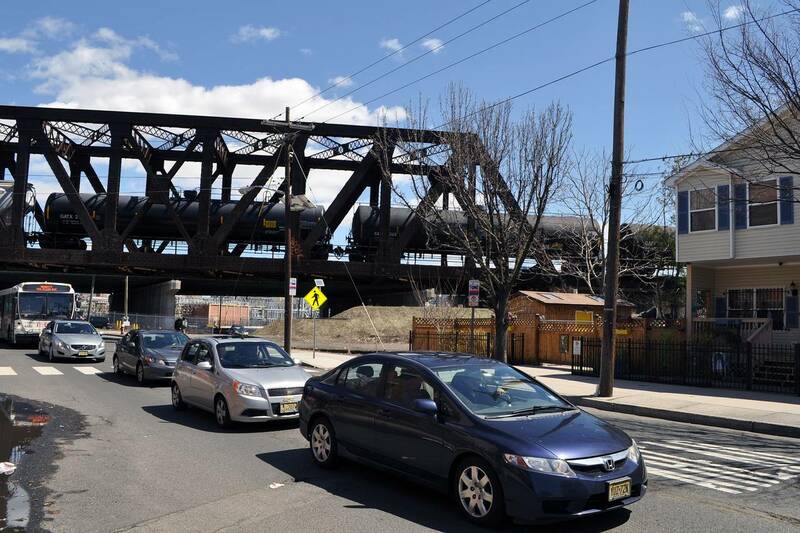 Railroad records show that about 20 oil trains a week pass through the county that contains Jersey City, and Mr. Fulop said the trains use the elevated track studied in the FEMA exercise. Even more trains hauling crude pass through other cities, including Chicago, Philadelphia and Minneapolis. Rail shipments of oil have expanded to almost 374 million barrels last year from 20 million barrels in 2010, according to the U.S. Energy Information Administration. Although low crude prices and safety issues have recently led to small declines in such traffic, trains carrying volatile oil from North Dakota and the Rocky Mountains continue to rumble toward refiners on the East, West and Gulf Coasts. Several oil-train derailments have produced huge fireballs, including two in March in rural Illinois and Ontario. In 2013, a train carrying North Dakota crude derailed late at night in Lac-Megantic, Quebec, killing 47 people. Regulators worry more about a serious accident in a densely populated area. “The derailment scenario FEMA developed is a very real possibility and a very real concern,” said Susan Lagana, a spokeswoman for the U.S. Department of Transportation. She said her agency was considering emergency orders to address such risks. Firefighters at the FEMA workshop in Jersey City discussed the difficulty of battling a crude-oil fire, which can be explosive and hard to extinguish. One problem: limited supplies of the special foam required to smother the flames. Ideas discussed at the workshop included devising a system to allow local officials to know when an oil train was passing through, developing public-service messages to tell residents what to do in case of a derailment and providing more firefighters with specialized training. There have been many calls for changes to how crude oil is handled on the railroads, including new speed limits for trains and requirements to treat the crude oil to make it less volatile. Earlier this month, the chairman of the National Transportation Safety Board urged the rail industry and federal regulators to move more swiftly to replace existing tank cars with ones that would better resist rupturing and fire. The Association of American Railroads recognizes that “more has to be done to further advance the safe movement of this product,” a spokesman said. 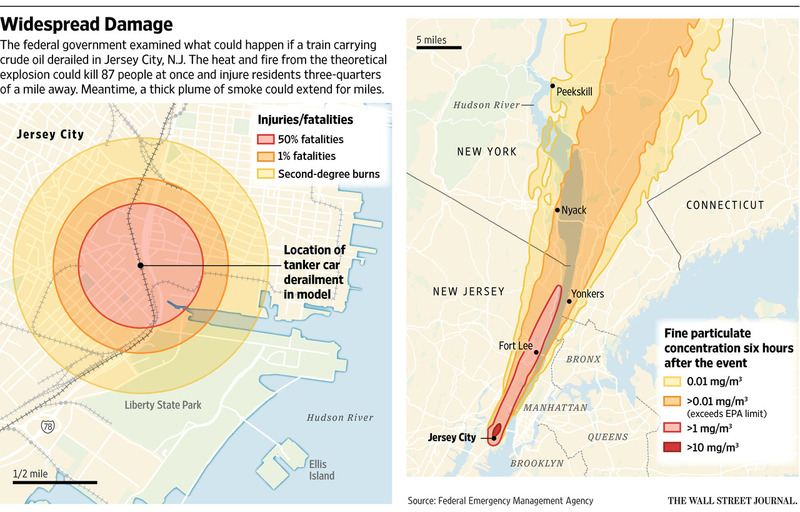 FEMA chose for the location of the derailment scenario a stretch of track adjacent to the New Jersey Turnpike and about a mile from downtown Jersey City. One side of the track is industrial and includes an electric substation. The other side is residential. 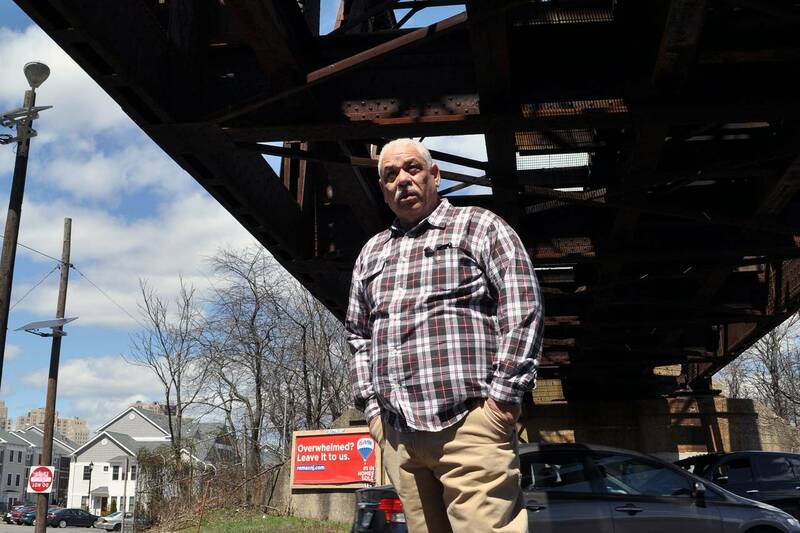 Edgardo Correa, a 59-year-old retired sanitation worker, lives in a house close to the tracks in Jersey City. He said he was aware that trains full of crude pass by his home. “It’s an alarming thing,” he said. —Joe Jackson contributed to this article.